This is made to order item. Please allow 3-4 weeks lead time for production. 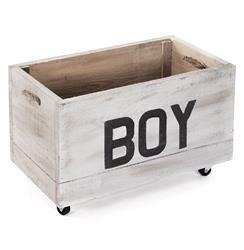 This antique whitewashed storage cart is perfect for a baby boy's room, playroom or industrial-style space. Mounted on casters for easy mobility, this sturdy crate holds tools, toys or any small household objects. Constructed from reclaimed wood, the distressed crate improves with age, like the boy who owns it. This item is made to order; please allow 2 - 3 months lead time for production.